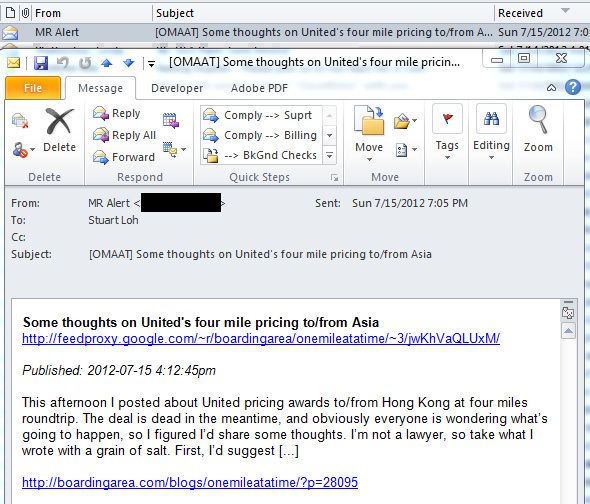 Hmmm… I seem to have just missed out on a UA deal which mispriced flights to HKG in F at 4 MileagePlus points (yes that’s literally 4, not 4k, or 70k, which is the normal going rate). Apparently it’s been already honored at least once (comment #169). I can’t seem to find a service that will reliably notify me when an RSS feed updates, so looks like I’m going to need to code one this evening. Update (6.53pm): And I’m done. I added on a new bit to my existing script which periodically scrapes this cheap fares forum for any postings for routings containing SFO, LAX, SIN or SYD and emails me. It now monitors a bunch of feeds for new posts from One Mile at a Time and a couple other FF blogs. First non-test poll should be at 7.00pm. stuloh The new MacBook Pro Retina is Awesome. With a capital A.